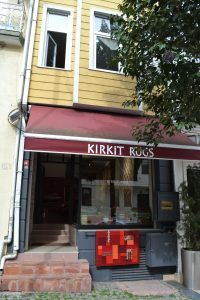 These remains are under Kirkit Rugs, one of the ever-changing roster of tourist-oriented businesses that have inhabited this building for the past few decades. The previous incarnation, Sedir Carpets, has some spectacularly bad online reviews. 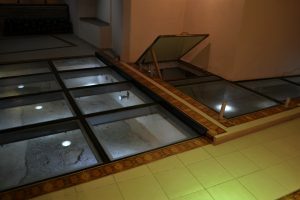 The current proprieter is accustomed to people coming in and wanting to look at the mosaics and vault. 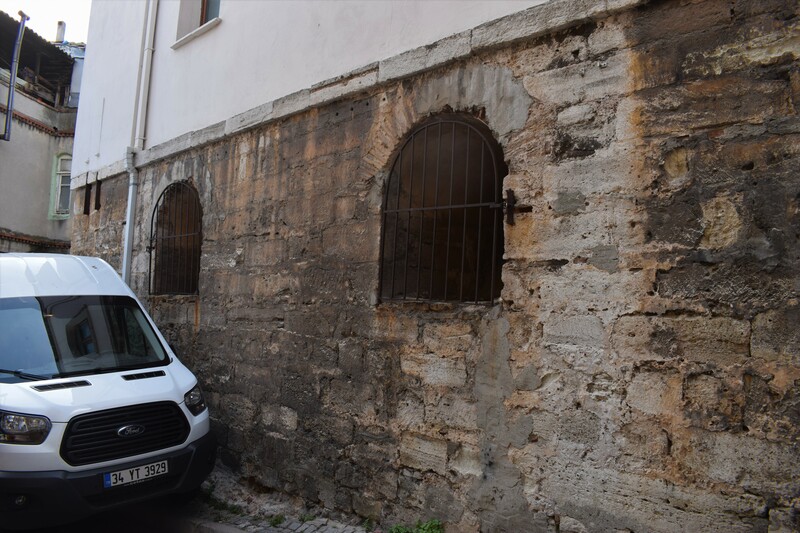 As with so many underground bits between the Hippodrome and the Marmara, nobody knows what this particular building (41.004668, 28.979834) was. 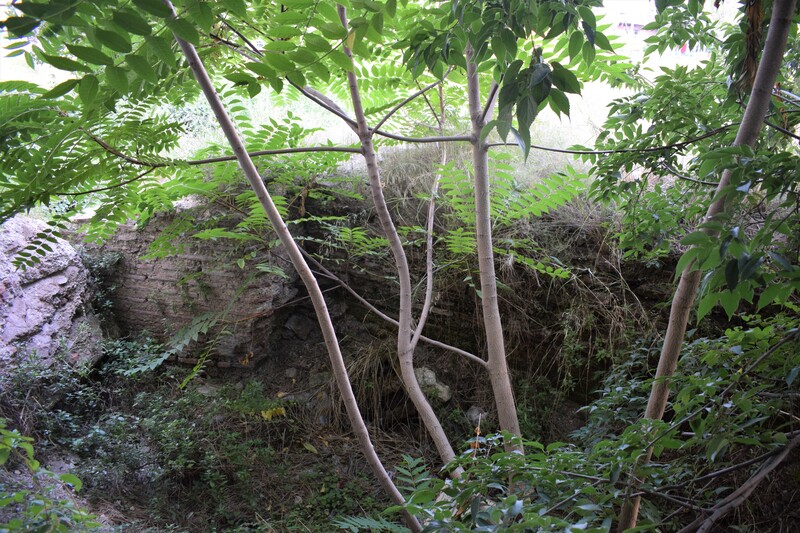 It is in a basement area of the great jigsaw puzzle that remains of the Grand Palace. 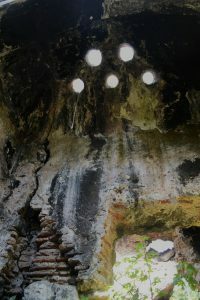 The presence of an ayazma and the fresco of the Hodegetria provide evidence that this building once served a religious function. The site was excavated by a team from Istanbul Archaeological Museum in 1997 – 98. 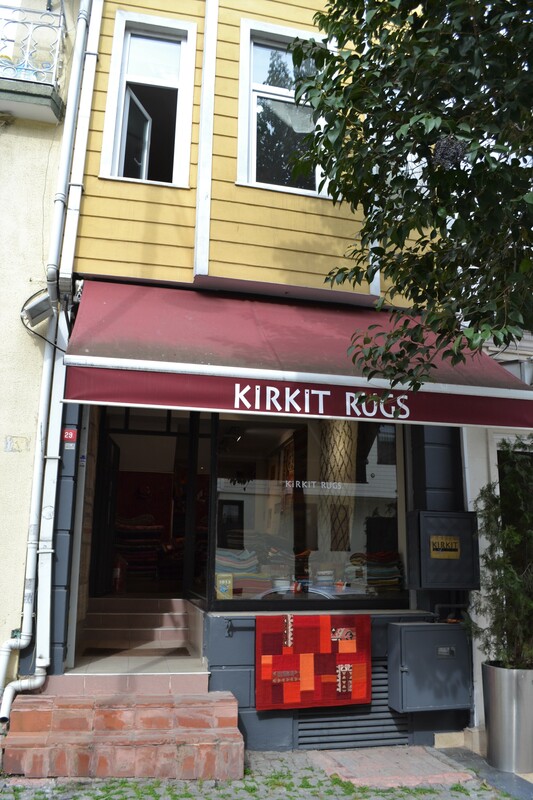 One descends a flight of stairs to a travel company with an entrance from Amiral Tafdil Sokak. Here, someone will point out an iron door and let you through if it has not already been opened. Alternatively, you may see some Byzantine wall fragments if you open a door that leads you outside to the north of the building. 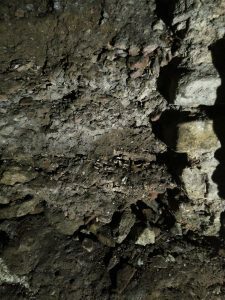 After some more steps down, one reaches a room where some wall fragments have been preserved and where most of the floor is covered with an illuminated glass covering. 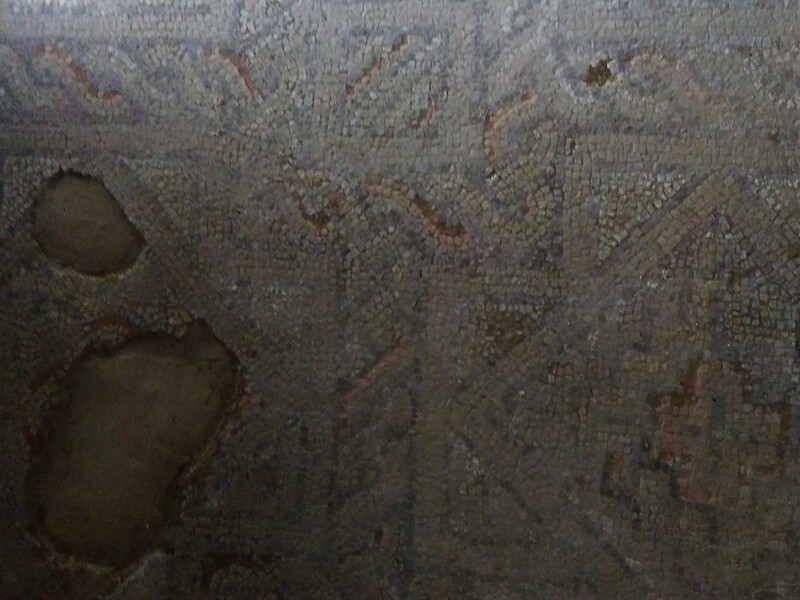 This protects an expanse of mosaic floor which may or may not be associated with the vaulted ayazma below. From the mosaic, another flight of stairs leads down to the single vault. This structure, with blind arches at each end, was once covered with fresco, most of which is gone. This site does not seem to follow the usual rule of layers going from oldest at the bottom to more recent as ground level is approached. The recessed brick technique in the vault is similar to that used in the churches of the Pantocrator and the Church of the Panagia Krina (Chios). 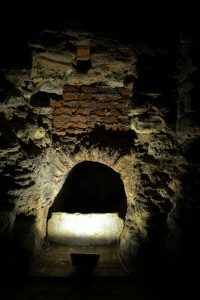 This is a strong clue that the vault dates from the 11th or 12th century. 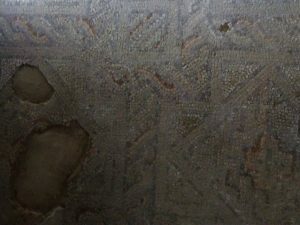 Oddly, the technique of the mosaic floor stems from the 5th century, when the large, palatial rooms of the Great Palace were built. The vaults beneath these appear to be 600 years younger and have a floor level about four metres lower. 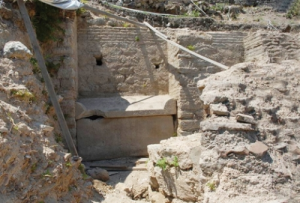 It appears that before the excavation in the late 1990s, the vault was something of a midden. The picture below shows layers of sheep bones and mussel shells. 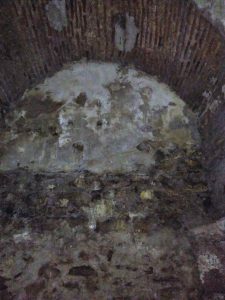 The vault was clearly once covered in fresco decoration. Now it is very hard to see any detail at all. 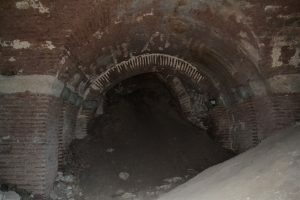 What distinguishes this vault from many similar structures in subterranean Cankurtaran is the ayazma (Hagiasma) or sacred fountain . It consists of a narrow channel flowing through the foundation and finishing with a pool housed in a barrel vault only about a metre high. There is an irregularly shaped, plain slice of marble partially covering the entrance. The real treasure is only seen by peering into the darkness past that slab of marble. Above the channel is a lunette with a painted icon of the Theotokos with Christ Child. A partially legible Greek inscription forms an arch at the top of the fresco. The iconography seems to resist interpretation. Some see this painting as a representation of the Panagia Hodegetria (‘She who shows the way’) with the Holy Mother holding the child and pointing to him as the way forward to salvation for all of humankind. 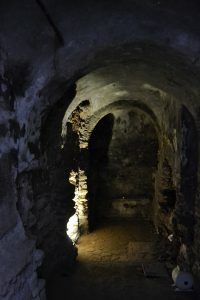 This has led some to suggest that the vault was the site of the Monastery of Hodegetria, a location that most evidence points to as being some distance to the north-east. 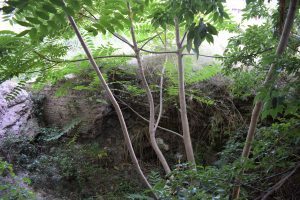 Others interpret the picture as evidence that this was the spring of Zoodochos Pege. 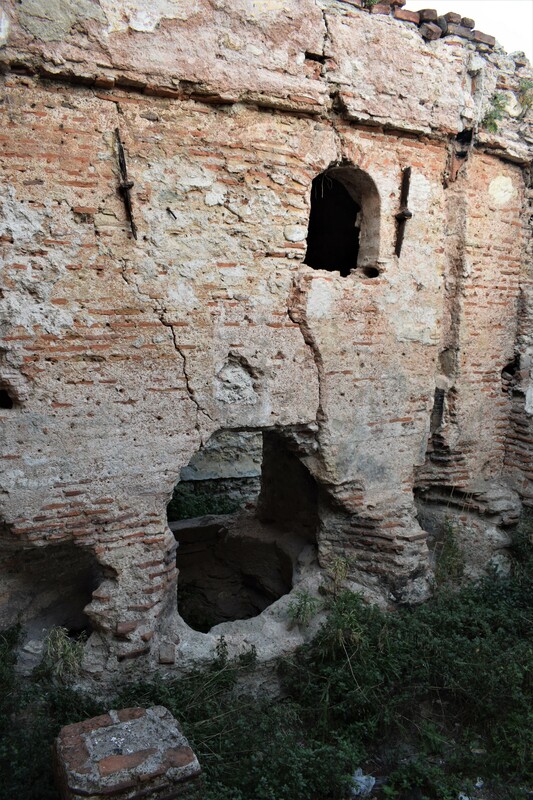 This seems almost certain to be in the well-known Balikli Monastery outside the Theodosian walls near Silivrikapi. A member of the team who excavated the building suggested that this vault was part of the foundation of the famous Nea Ekklesia but the brickwork seems to be from much later than that church’s building date. 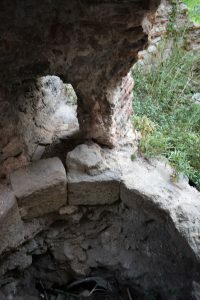 It seems likely that this was an undistinguished chapel built over a little spring that surfaced in someone’s basement during the Latin occupation, or perhaps soon afterwards. To place this vault in context, it lies not 200 metres from the major foundations associated with the Grand Palace. 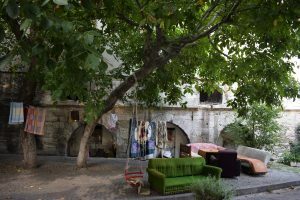 One of them, beneath the Palatium Restaurant (41.006248, 28.980492) is labelled as Senate House, part of Magnaura Palace. The other, beneath a car park a few metres east of the Mosaic Museum (41.004061, 28.978048) needs some subterfuge to enter. 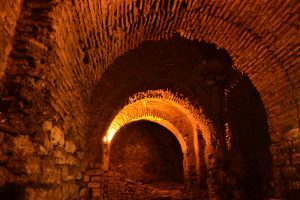 The extent of these two sites, combined with the many other vaults and cisterns beneath almost every building in the district, shows that the below ground parts of the Grand Palace were gigantic and that large swathes of the palace are still worth exploring. 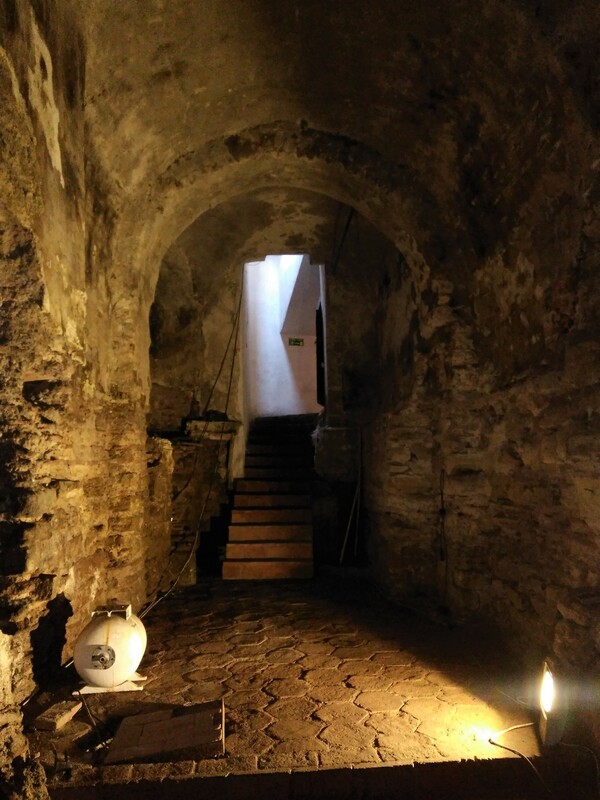 Our vault beneath the carpet shop may just be a tiny chapel in an enormous, continuous block of subterranean Constantinople. Denker, A. et al. (2015) Exhibition Catalogue. Hayat Kısa, Sanat Uzun: Bizans’ta Şifa Sanatı (Life Is Short, Art Long: The Art of Healing in Byzantium) Suna ve İnan Kıraç Vakfı Pera Müzesi. Page 71. 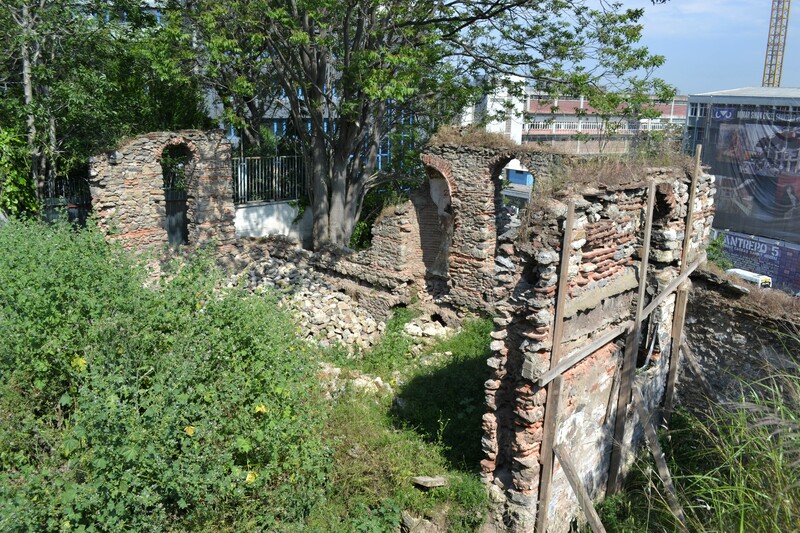 The area north of Tophane houses a conglomeration of ruins of mixed Byzantine and Ottoman origins. 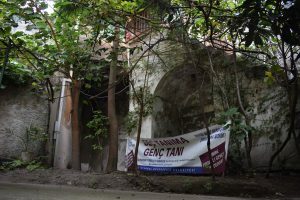 One of the more interesting buildings here is a hamam (bathhouse) which appears to have been founded in Byzantine times and renovated and added to ever afterward. 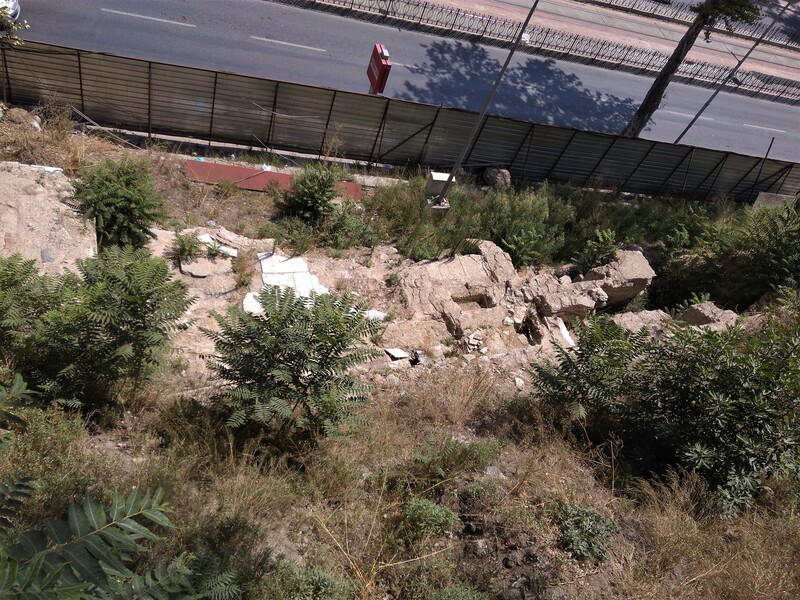 Between this and the coast road is the remains of a set of Ottoman artillery barracks (41.028059, 28.983344). A recent project to rebuild the barracks unearthed some rich Byzantine findings including a necropolis that appears to be linked to a monastery. This may be from the 4th-5th centuries. There is something of a controversy between those who want to examine the monastery remains and those who want to stop the archaeological work to rebuild the military edifice. We await further news. There appears to be a plan to transform the place into an Arkeo-park under the auspices of Mimar Sinan University, similar to Koc University’s effort at Kucukyali. 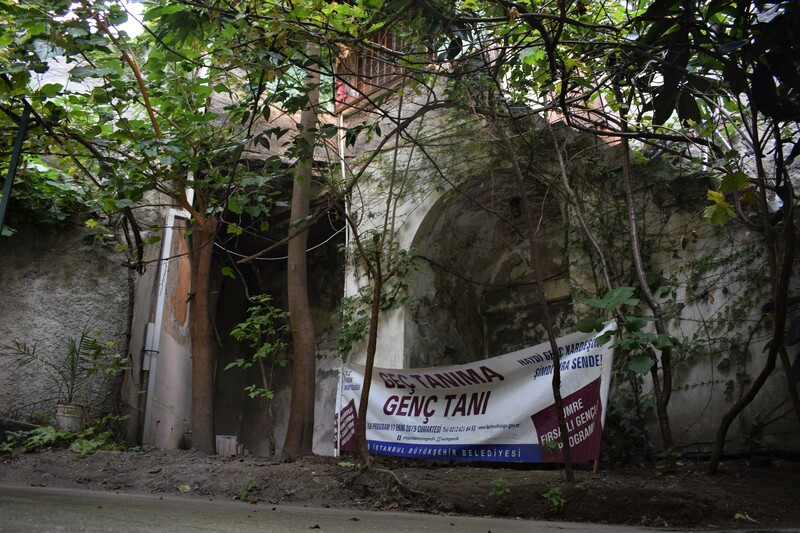 Sandwiched between the area of the old Grand Palace and the newer Bucoleon is this undistinguished mosque (41.003265, 28.976672). 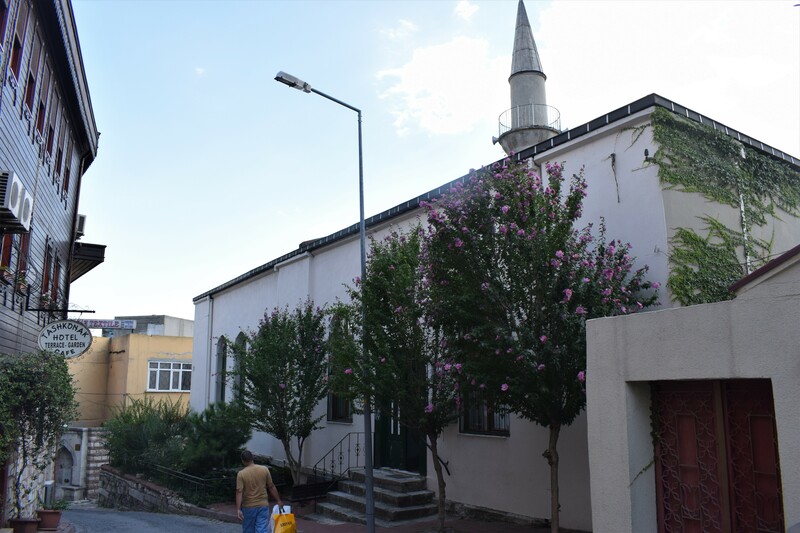 Apparently, the mosque was a product of the great Sinan, constructed in 1533, but fires necessitated complete rebuildings in 1766 and 1825. The interesting thing about it, from my point of view, is the substructure. 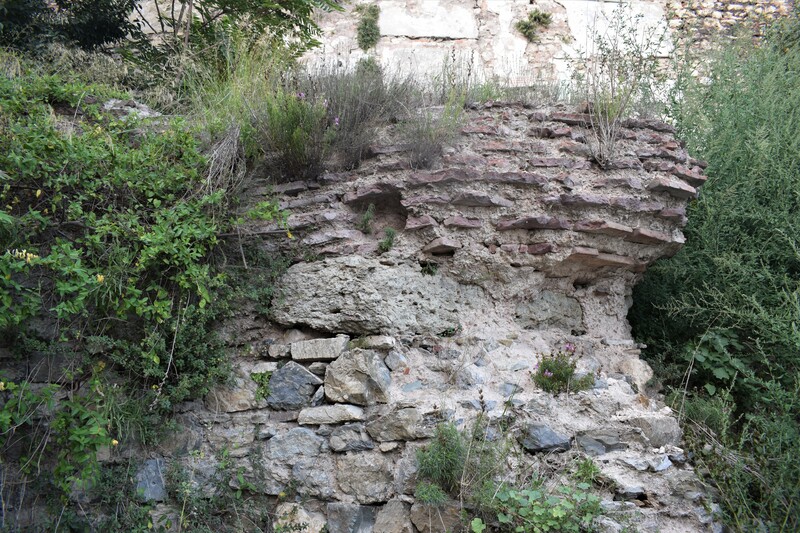 As with the Monastery of St Mary Peribleptos in Samatya, the modern structure rests on Byzantine vaults. 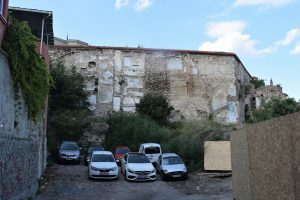 Kostenec acknowledges that the evidence is ambiguous, but the presence of a Byzantine building of this size aligned on an (approximately) east-west axis argues for the foundations originating as the support for a church. The building was immediately inside the wall of Nicephorus II Phocas, which places it inside the grounds of the Grand Palace as defined by these 10th century fortifications. The south (or south-eastern) face of the substructure displays four arches, not entirely Byzantine in appearance. Presumably, some reconstruction was undertaken after one of the fires. This area is a peaceful backwater in this crowded region below Sultanahmet Camii and is comfortably furnished for local residents to enjoy family life. The eastern face is a plain stone wall with two arched windows. 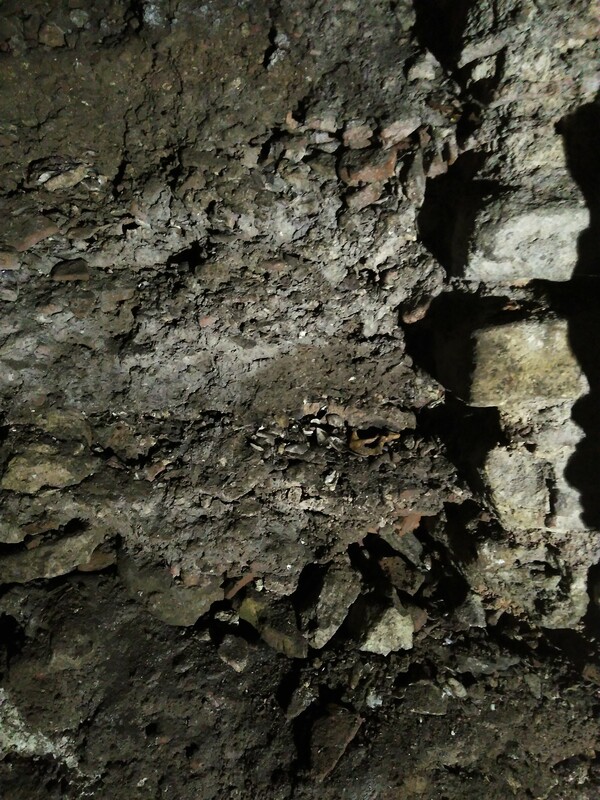 The understory has remained unplastered, which allows the precise stonework to be examined. 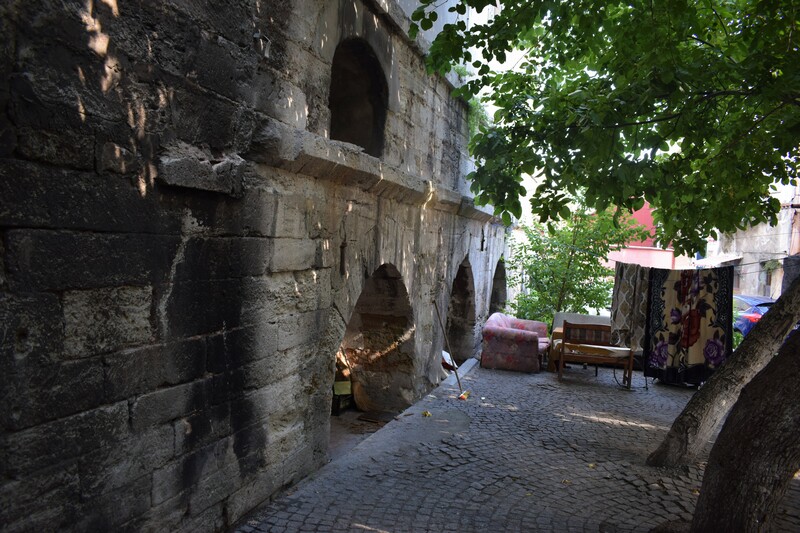 The lower metre of so of the building immediately to the west of the mosque resembles the facing of the 5th century rebuilding of some of the aqueduct bridges in the Roman/Byzantine aqueduct system that passes beyond Vize. Especially noticeable is the protruding string-course above the arch on the south face. 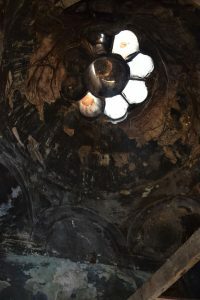 The window at the top is seen from the inside in the next photo. The vault is accessible from the iron staircase to the ablution facility on the north-western side of the building. The western end is used for storage of building materials. The stonework has been plastered over and this makes it difficult to assess the age of this part of the building. The vault itself is an undistinguished section of apparently Byzantine stonework. The eastern section is larger and lacks the curvature that might indicate the presence of apses that would identify the structure more strongly as a church. 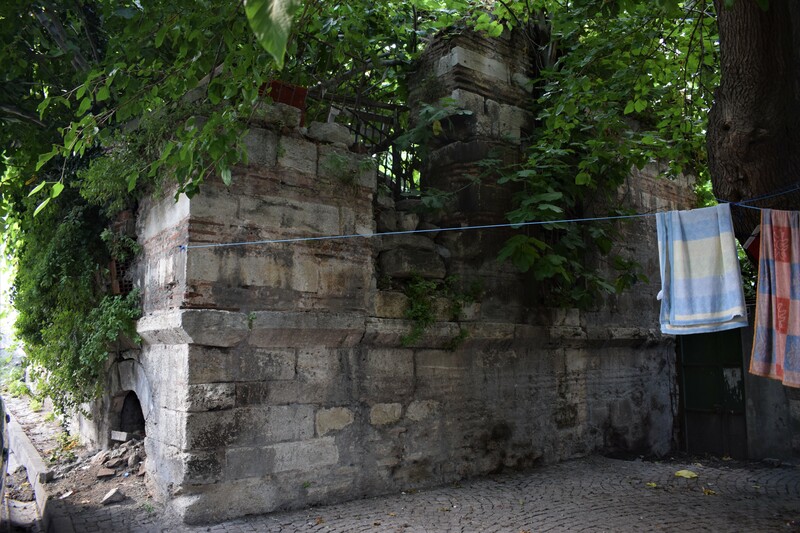 A nice Byzantine touch is represented by two artifacts at the south-east corner of the mosque. 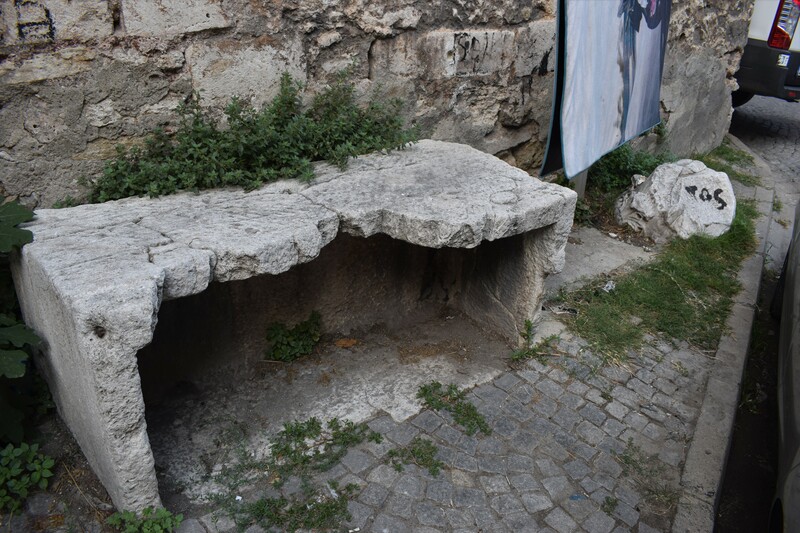 A sarcophagus placed on its side and mortared into the pavement serves as a park bench. A Corinthian capital lies on its side a little to the east of this. 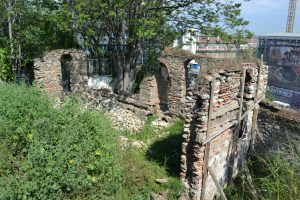 Fifty metres to the west of the mosque (41.003436, 28.977845), a house was demolished in about 2000, revealing some solid 11th or 12th century masonry tucked against the massive wall of the Grand Palace terrace. According to Kostenec, this is close to the site of the 9th century Nea Ekklesia. However, this stonework dates from a couple of centuries later. 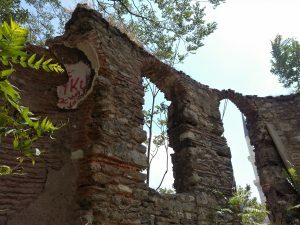 It appears to be the remains of a church but it is difficult to link these ruins with any church for which records exist. The plant growth is thick and covers most detail. However, a distinctive floor plan of a very solid building may be discerned. There is some doubt as to whether this is a church or not. 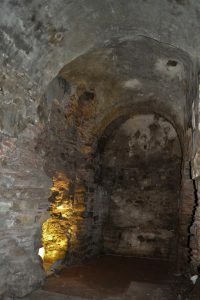 The apse faces southwards, meaning that it would be on the north wall of the chamber of which it was part, rather than the expected eastern side. 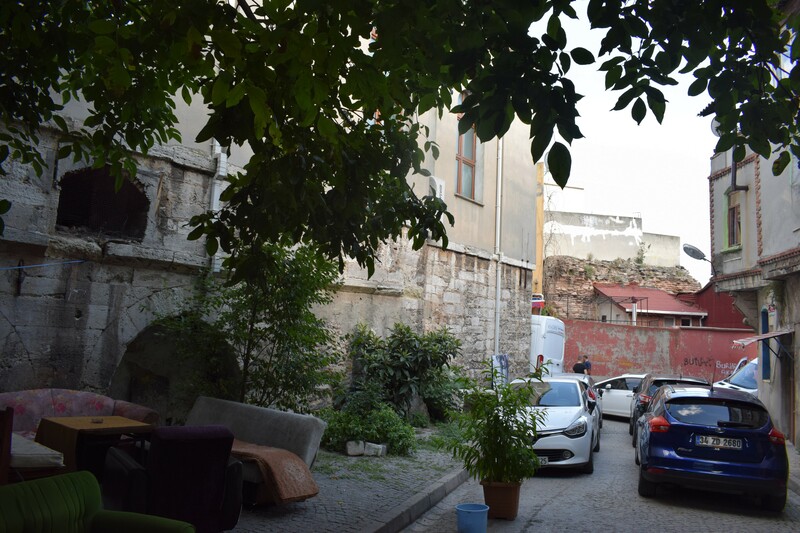 A little to the east (41.003660, 28.978167) is an interesting building that appears to be an Ottoman addition to Byzantine foundations. This is a strange agglomeration of bits, including some 20th century plumbing. 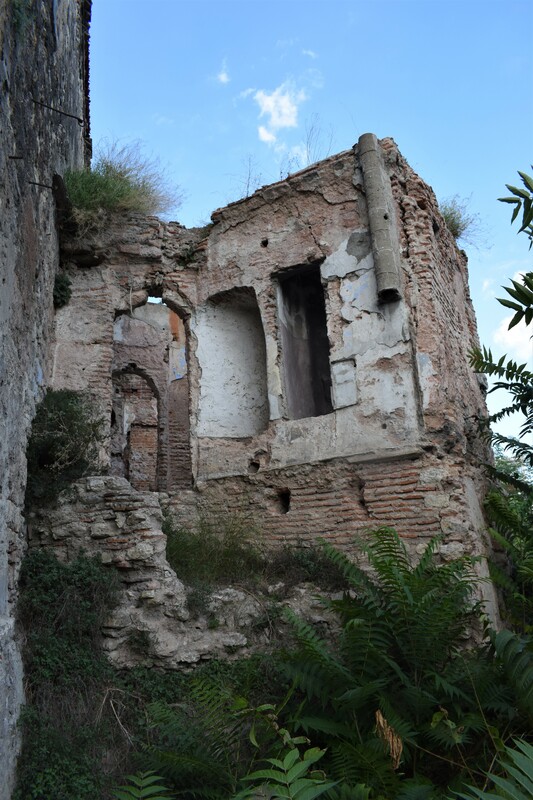 However, the lower level appears to be more consistently Byzantine. The northernmost section of the building has the most clearly defined foundations. 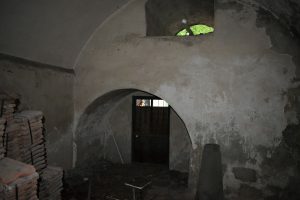 In the archway at the bottom can be seen a curved section of stonework supporting some later brickwork. 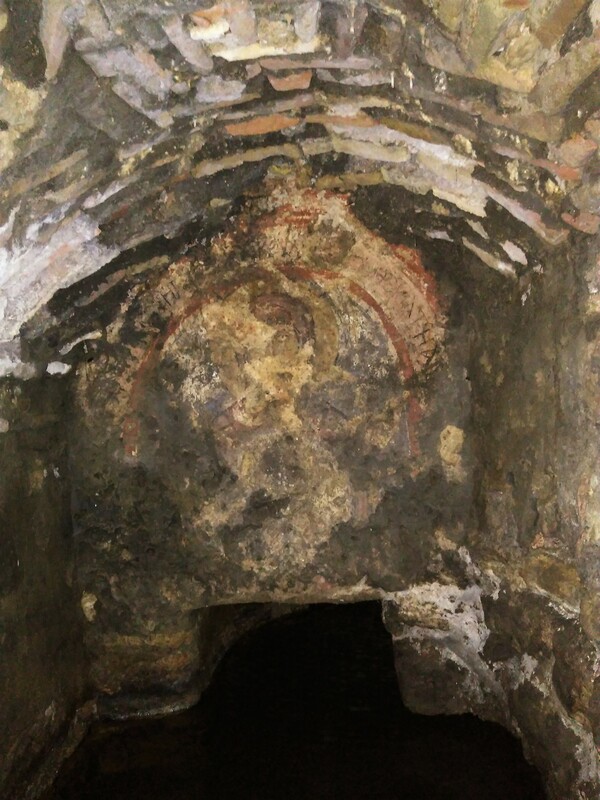 This resembles a small apse of a traditional 3-apse church of the 11th-12th centuries. It is on the usual eastern end of the building. The remainder of the church (if it is a church) has been obscured or destroyed by whatever has happened in the area over the last 800 years. 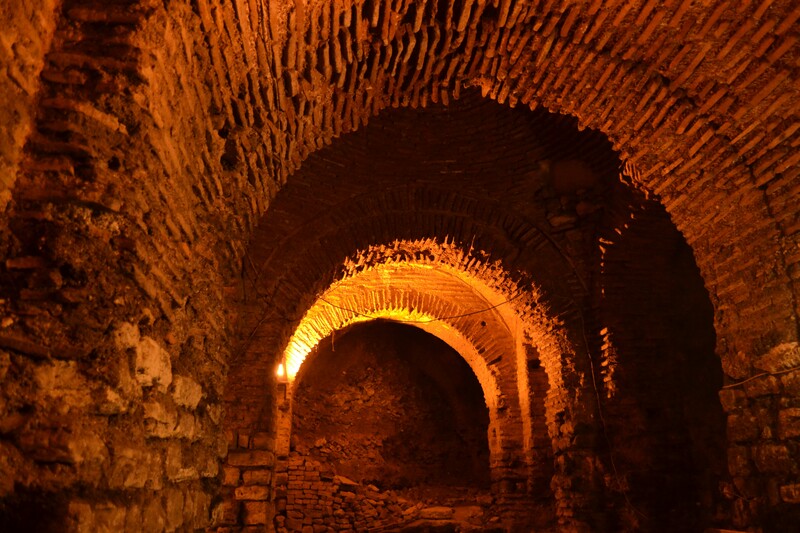 Almost everything underground in the south of the Grand Palace area is Byzantine. Mamboury did a sterling job in the first half of the 20th century recording and interpreting the shattered remains in what was largely a deserted area. It is a good thing that he did because almost the whole area has been covered with piecemeal development catering to our rampant and lucrative tourist industry. One odd building across the road from the above site (41.003321, 28.977924) deserves a look. It is a narrow, precarious pile of brick with the remains of an amazing domed ceiling. 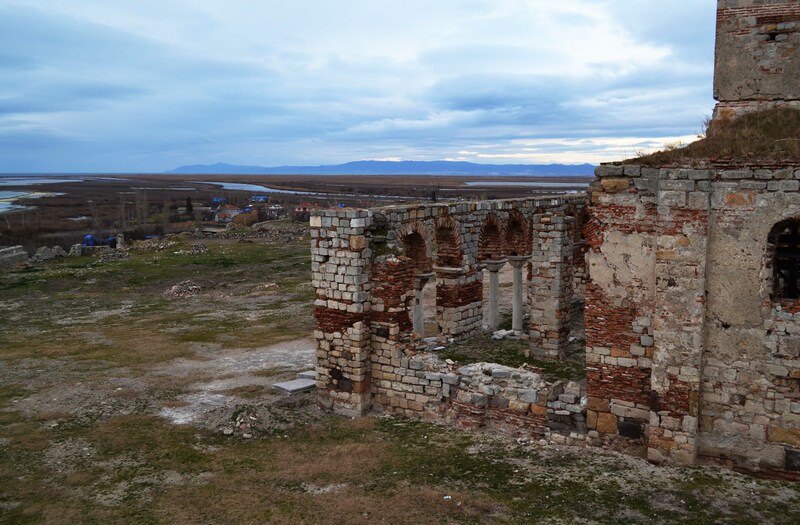 Nothing to do with Byzantine churches, but worth seeing. 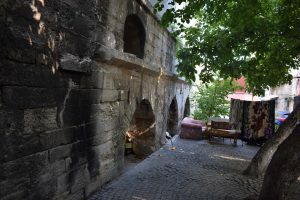 Kosterec, J. (2007) Walking Thru Byzantium: Great Palace Region. Byzantium 1200 Project. Grafbas A.S.